“Zachariah” (1971, Kino Lorber) Cowboy naifs John Rubenstein and Don Johnson vie to be the most fearsome gunfighter in an Old West where rock groups and gurus share space with sagebrush and six-guns. 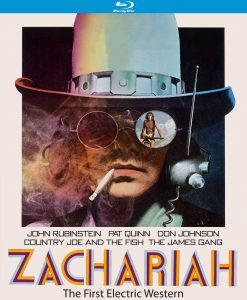 Enthusiastically freaky “electric” Western, based loosely on “Siddhartha,” and with an exceptional pedigree: the script was co-written by the counterculture comedy troupe the Firesign Theatre and Joe Massot, who directed “Wonderwall” and worked on “The Song Remains the Same” before Peter Grant gave him the boot. George Harrison had initially planned to produce and score the film, and at various times, Bob Dylan, Brigitte Bardot, the Band and Ginger Baker were slated as stars. None of that came to pass, but you do get songs performed on-screen by the James Gang, Country Joe and the Fish, Doug Kershaw, the New York Rock & Roll Ensemble (with Michael Kamen and Mark Snow), White Lightning, and jazz legend Elvin Jones, who cuts a formidable figure behind and away from his drum kit. Kino’s Blu-ray includes a lengthy interview with Rubinstein, now a prolific character actor, as well as commentary by Howard S. Berger and Nathaniel Thompson. 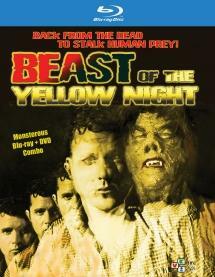 “Beast of the Yellow Night” (1971, VCI Entertainment) Facing starvation, WWII deserter John Ashley offers his soul to a bemused Satan (Vic Diaz), who grants him immortality with a complicated catch: Ashley must collect new souls by possessing and then corrupting various individuals, but if he fails, he’ll transform into a homicidal monster. Roger Corman launched New World Pictures with this Filipino-made horror movie from writer/director Eddie Romero and co-producer/star Ashley, who previously struck drive-in pay dirt with such outrageous sci-fi creature features as “Mad Doctor of Blood Island.” “Beast” attempts to distinguish itself with philosophical musings about religion and free will; these moments thicken an already-muddled storyline and detract from what most viewers have come to see – Ashley turning into the Beast of the Yellow Night (which, it should be mentioned, happens mostly during the day and without much yellow) and running amuck – but credit is due for trying to fold in a layer of depth. 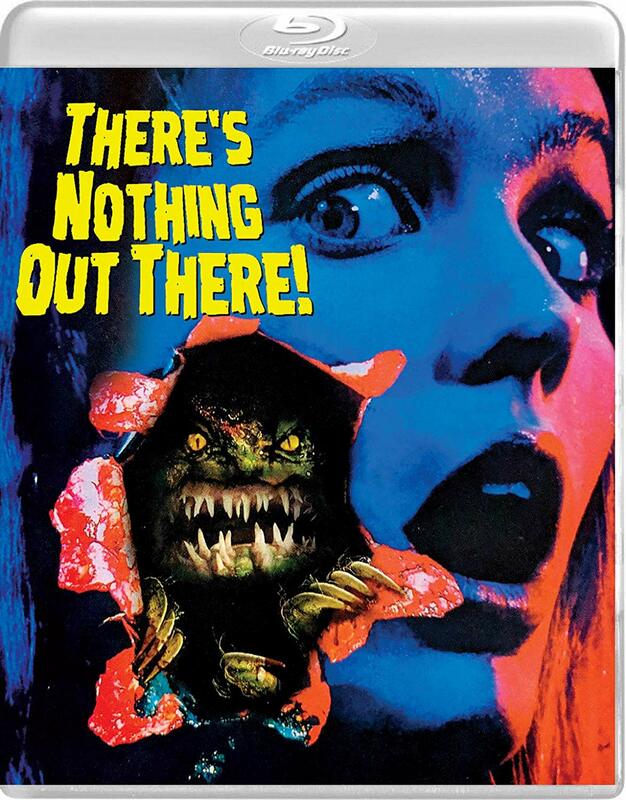 VCI’s Blu-ray/DVD set features a restored image, commentary by the aforementioned Thompson and Berger (who also contributes liner notes), and interviews with many of Ashley’s friends and collaborators, including Romero, Sid Haig, Fred Olen Ray and Andrew Stevens. “Invasion of the Blood Farmers” (1971, Severin Films) Stay with me for this one: a modern-day druid cult drains the blood from the (unquestionably moronic) residents of a small town in upstate New York to use in a ritual to revive their undead queen, who rests in what appears to be a Lucite box. Low-budget, regionally lensed lunacy, made by director Ed Adlum (now the editor of the coin-op industry magazine “RePlay,” and an all-around good guy) and “Creem” writer Ed Kelleher with tongue planted firmly in cheek and with no intention other than to amuse and/or disgust the audience with a barrage of gloppy gore and goony performances. Beloved by junkfood film devotees, of whose ranks you can now join with this Blu-ray, lovingly assembled by Severin; Adlum is front and center on a commentary track and retrospective featurette, which covers his adventures in rock and roll and exploitation (he also directed the equally out-to-lunch “Shriek of the Mutilated”), and there are interviews with actor Jack Neubeck and cinematographer Frederick Elmes, who went on to film “Blue Velvet,” “Night on Earth” and “Valley Girl” (!). “There’s Nothing Out There!” (1990, Vinegar Syndrome) An alien creature stalking a gaggle of teens in a remote cabin meets its match in the group’s odd man out, a hyperactive nerd whose knowledge of horror movie tropes allows him to foresee its every move. Though this no-budget creature feature – also from with the wilds of New York State (Piermont, to be exact) – trucks in many of the same clichés it purports to parody – the protagonists are the same hormonal knuckleheads you’d see in any slasher/monster pic from the last 35 years – director Rolfe Kanefsky, who was 19 at the time of filming, lends a surprising degree of polish to his 16mm effort, as well as an amusing thread of meta-awareness which predates “Scream” and remains its most memorable aspect. Vinegar Syndrome’s 2K restored Blu-ray/DVD offers every possible scrap of production information in its supplemental features, which include three commentary tracks – two with Kanefsky and cast/crew, the other by the Hysteria Continues podcast crew – as well as new and vintage interviews, short films by Kanefsy, audition rehearsal and test footage, a music video and more. 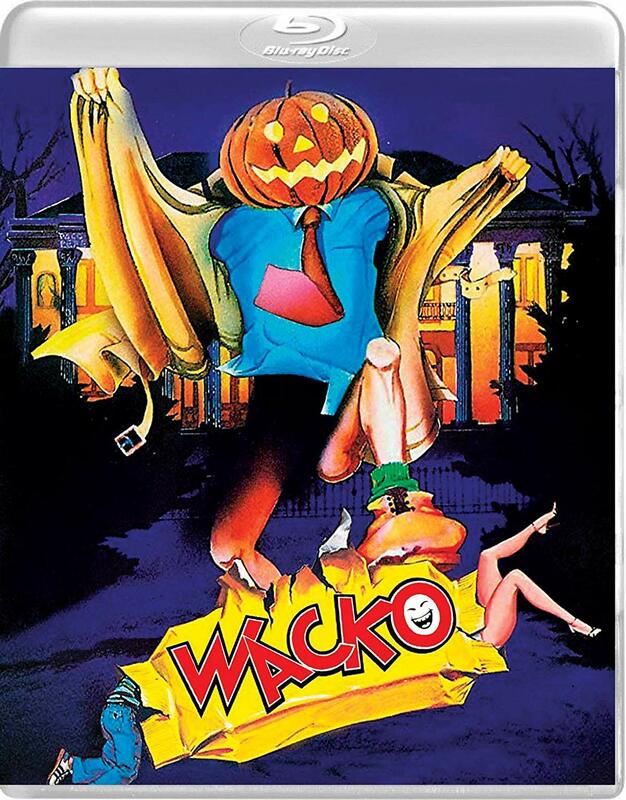 “Wacko” (1982, Vinegar Syndrome) Thirteen years after her sister was murdered by the pumpkin-headed Lawnmower Killer, high school student Julia Duffy and slob detective Joe Don Baker are convinced that he plans to strike again. Slasher spoof by Greydon Clark (“Black Shampoo,” “Satan’s Cheerleaders”) labors mightily in an attempt to generate an “Airplane!”-styled avalanche of gags, and earns modest returns, though the cult favorite cast – which includes George Kennedy, Stella Stevens, E.G. Daily, Andrew “Dice” Clay and the great Charles Napier – works overtime to achieve that end, especially Baker, who tackles any absurdity/indignity thrown his way (e.g., dressing in drag) with admirable gusto. Vinegar Syndrome’s Blu-ray/DVD includes commentary by Clark and an interview with cinematographer Nicholas von Sternberg, both of whom detail the challenges of low-budget filmmaking. 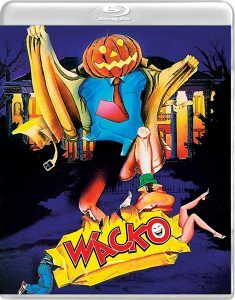 This entry was posted in Movies, Music and tagged Kino Lorber, Severin Films, VCI Entertainment, VInegar Syndrome. Bookmark the permalink.